You guys, I don’t often fall in love with inanimate objects. This one time though, I’m willing to make an exception. I have seen these beauties all over the internet. Pinterest especially seems to be going gaga over these Kate Spade storage boxes. And while they are gorgeous, I nearly fell out of my chair when I saw their $54 price tag. Fifty-four dollars? For empty BOXES? I think not. So I decided to make a knock off version. 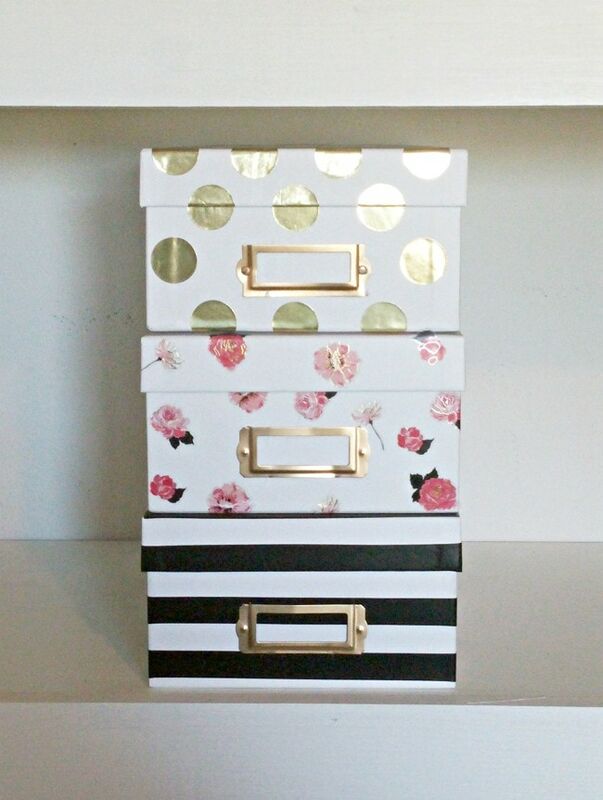 A set of Kate Spade INSPIRED storage boxes if you will. They are modeled after the real deal and at a much more reasonable price point! Are you ready to see how incredibly easy this project is? For my pink rose stickers I used Heidi Swapp’s Memory Planner Sheer stickers. I got these at Michael’s as well on clearance. You could use any rose stickers. I bought 4 packs of these (I only used 3 of them) and it was enough to do just the front of the box. I could have done more but you only see the front of the box from the shelves anyway! 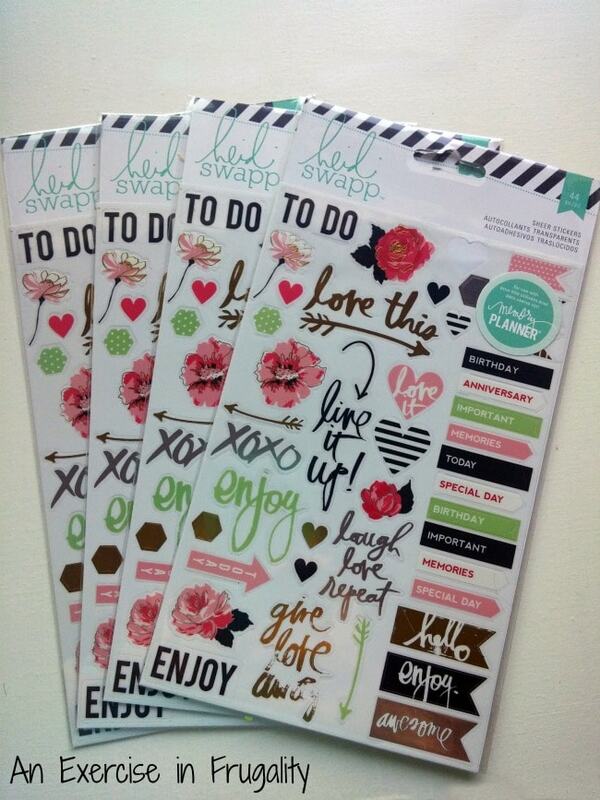 I will use the other stickers for using in my Erin Condren Planner so none of them go to waste! 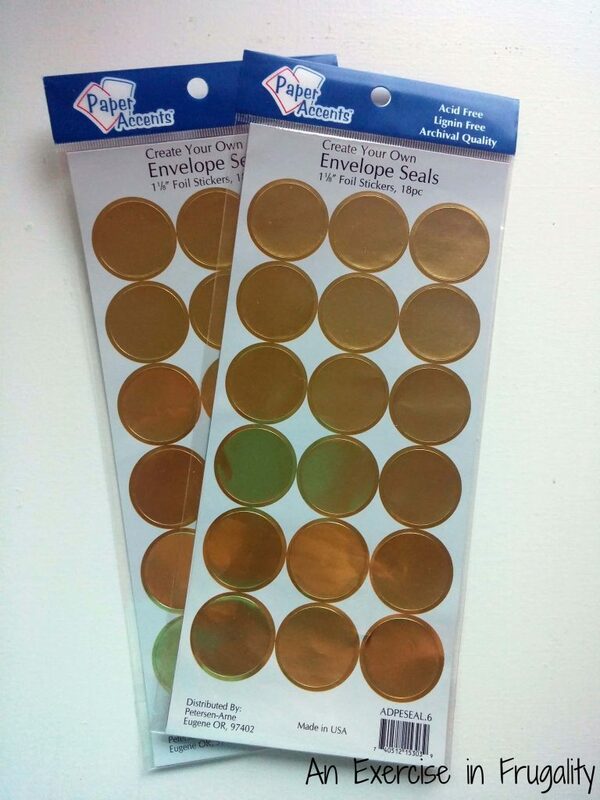 The gold seals I got at Walmart for $0.97 per pack. I used 3 packs to do the front and top of the box. I wanted black ones (since the real Kate Spade Storage Boxes have black dots) but I couldn’t find any. I figured gold matches as well. You could paint the dots black if you wanted, but I thought this would be easier! 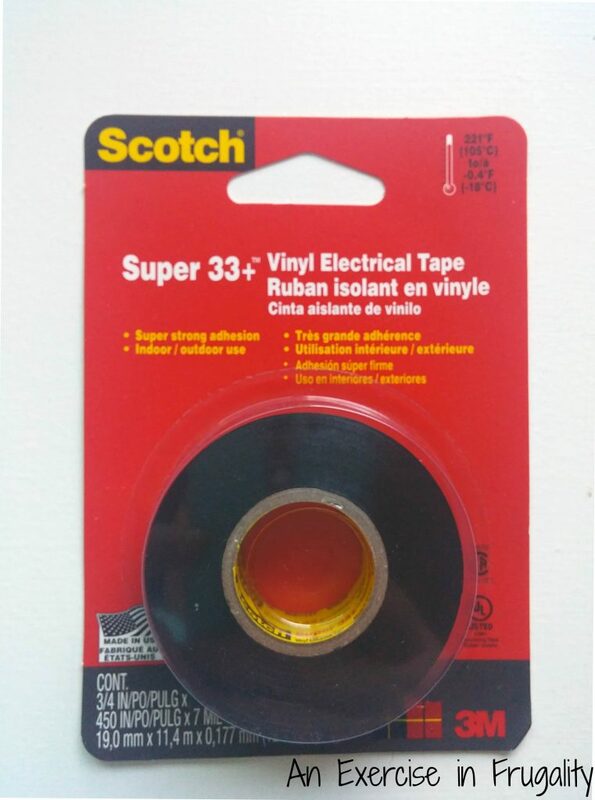 Finally I got just some plain ol’ black electrical tape at Target. Doesn’t get any easier than this! From here, it should be pretty obvious, just stick everything on! I used the electrical tape to measure the width of the empty space so that the white and black lines were even. The great part about all this is that because of the glossy surface of the boxes, you can remove and re-stick if you make a mistake! I was able to adjust the gold dots and the pink roses as needed to get the right spacing. The nameplates on the boxes were silver, so I gently pried them off (they have little prongs and pop right out) and gave them a quick coat of gold spray paint, let them dry completely, then popped them back on. So that’s it! Way simple, no painting or measuring required. In total this Kate Spade inspired storage box project took me about 15 minutes to do. You could even have the kiddos help! PS: Like the shelves pictured above? Find out how to build your own floating shelves here. It’s easy! I think $15.88 is a lot more reasonable of a cost for storage boxes compared to $54, don’t you? Oh and if you’re looking for more cute office decor, check out this simple DIY gold mouse pad tutorial too! 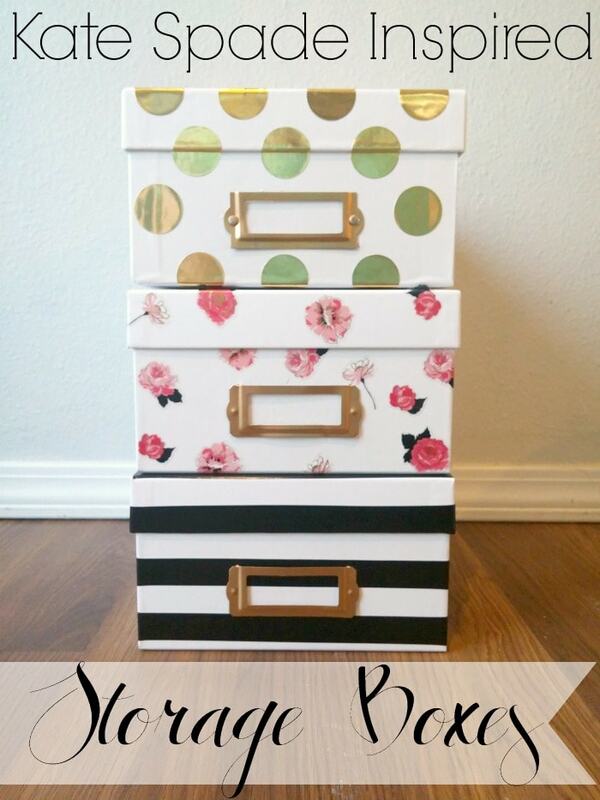 Who do you know that would love my Kate Spade Inspired Storage Boxes? I love the Polka Dots! Next time I go to Michaels, I will need to get some of these items on sale. I did not know Kate Spade made photo boxes, I love her stuff. These so look like here designs, they turned out great! I didn’t know either until I started seeing them all over Pinterest! I fell for these boxes hard! These are amazing. Great idea, easy, and not as costly. I love that you made these yourself! They are so cute (and way better than the $54 ones!!). This is an awesome idea. You rocked the Kate Spade look! THese are adorable, they would fit in right on my shelves in my media room to organzie my kids paper, looks better than the stacks I have. I love this! I have a ton of photos that I need to store and these are beautiful. Thanks! Totally loving this! I especially love the gold circles. Great way to save a ton of cash! They turned out absolutely adorable. I would definitely try to make these I have some gold vinyl stickers I can use and some boxes thanks a bunch. OMG yours are perfect! I’m a big Kate Spade fan but $54 for 3 boxes is insane! Those ended up looking really cute! Great job, I love them! These came out great! I love these boxes, and saving money by doing them yourself is a huge bonus! These look incredible! I will definitely have to try doing these for myself! These are so good, I honestly thought they were store bought. Great job! I can’t believe you decorated these just using stickers and tape! I wish I was this creative! I was thinking I like Kate Spade but that line can get pretty expensive. Then I kept reading and saw the price, lol. Kudos to you for making your own! These are really pretty. I need to make some for my blog storage! This is brilliant! I love Kate Spade, but it’s a pretty big splurge! These look so cute. I can’t wait to try to make some for myself. These are so cute. I am definitely making myself some. I really like storage boxes – this is a fun project – I think I will be decorating boxes to use for gifts. I am such a stationary addict! Those stickers are too cute! I need to check them out. Fun! I love those Kate Spade boxes, but they are pricey. They look great! Stopping by from the SITS link up! These are so cute! Love how you made them for such a great price. Her stuff is cute buy out of my price range! 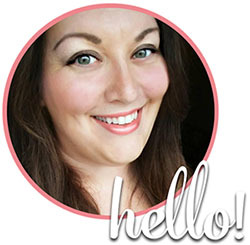 Stopping by from the SITS link up – Happy Weekend! Love your Kate Spade inspired boxes! I included them in a roundup of Kate Spade inspired projects. Thanks for sharing your creativity. Sorry forgot to include the link for you. Can you make 6 striped ones for me? Pretty please? Can we talk?